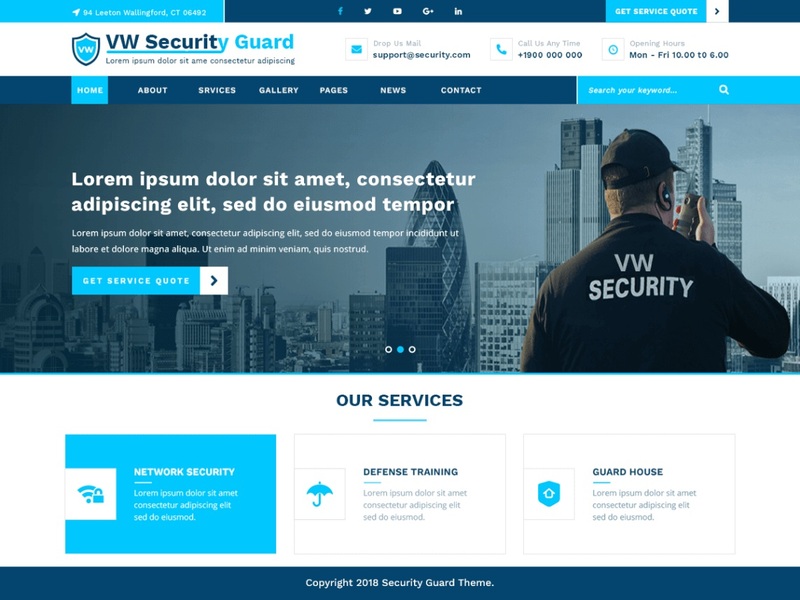 VW Security Guard is a sophisticated, clean, technically advanced, powerful and robust WordPress theme for security guards, security services providing companies and agencies, bodyguards, commando training institutes, self-defense training classes, and other similar websites. It is stuffed with top-notch features to never make you feel short of anything that a great website needs. It essentially has a fluid layout that responds to varying screen sizes. It is cross-browser compatible, multilingual with WPML compatibility, RTL supportive and SEO ready. Customization is its powerful feature that gives you the freedom to design the website according to your specifications. Everything from color, background, menu, header, footer, and layout can be changed through theme customizer which has a user-friendly interface to get your work done within minutes. It gives a stream of options like multiple blogs and page layout, header and footer style, sidebar layout to change the look and feel of the website. It has smartly used banners and sliders to impress visitors. Social media icons are embedded in this security theme to make the content shareable on multiple networking sites. VW Security Guard is coded from scratch and is built on the Bootstrap framework.